Giannis Ragousis (Greek: Γιάννης Ραγκούσης, born on 11 December 1965) is a Greek economist and politician of the Panhellenic Socialist Movement. Giannis Ragousis graduated from the Department of Financial Studies of the Aristotle University of Thessaloniki with a major in Economics. He completed his studies with a master's degree in Financial Development from the University of Sussex, U.K.. Giannis Ragousis is fluent in English. Giannis Ragousis, was a member of the Rectors Council, as well as the F.E.A.P.TH. from 1986, until 1989. From 1991 to 1993 he was the Secretary of PA.S.P., the youth division of the Panhellenic Socialist Movement (PASOK), as well as a member of the Central Council of the National Students Union of Greece (E.F.E.E.). Giannis Ragousis was a member of the Central Committee of PASOK from 1994 until 1996. In 2003, he was elected Mayor of Paros, a post he held until 2007. 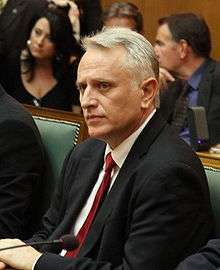 He was first elected to the Hellenic Parliament on 16 September 2007, having been appointed party spokesman on 15 August. After the 2009 election, George Papandreou made Ragousis his Minister for the Interior, Decentralization and e-Governance. He kept the post until a cabinet reshuffle on 17 June 2011, when he was appointed Minister for Infrastructure, Transport and Networks. On 11 November 2011, he became the Alternate Minister for National Defence in the national unity government of Lucas Papademos. Giannis Ragousis is married to Katerina Roussou. They have a son, Nicolas and two daughters, Irene and Vassiliki.